A Jones fracture, or fracture of the 5th metatarsal base, is not a very common sports injury. 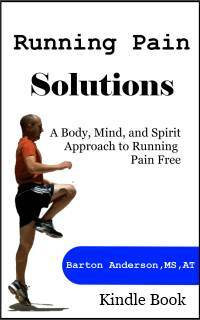 However, even despite its low prevealence, it can happen, and can sometimes cause major problems with recovery. Seventy five percent heal normally, but the other twenty five require surgical intervention. Read on to learn more about this unique foot fracture. Simply put, a fracture is a break in a bone. They can be small, large, hairline, or compound. Broken bones and fractured bones are the same thing, just different names. A Jones fracture is a specific type of fracture that occurs at the base of the 5th metatarsal. Where is the base of the 5th metatarsal? Run your hand along the oustide of your foot, starting at the pinky toe. As you move closer to your heel, you will feel the end of the 5th metatarsal sort of sticking out along the edge. This is where a Jones fracture occurs. I have circled the base of the 5th metatarsal in the picture on the right. Pain, swelling, and difficulty walking are all common symptoms of a Jones fracture. Also, some type of twisting mechanism, or a blow to the foot. While a broken bone can be painful, this type of fracture can also be confused with a sprain, and may be overlooked. As with any injury, if you have significant pain, swelling, or dysfunction, you should see your physician for an evaluation. Jones fractures are usually caused by a twisting of the foot. It can be associated with an ankle sprain, or the same type of motion that causes an ankle sprain...rolling over the outside of the ankle. As with any type of fracture, any force that is of sufficient force can break the bone. So, being hit on the foot, or stepped on by a 300 pound lineman can also cause a fracture. There is a Watershed in Your Foot? Not an actual watershed (come to think of it, I am not sure I know what a watershed is). Watershed is a term used by physicians and medical professionals to describe an area of low blood supply. 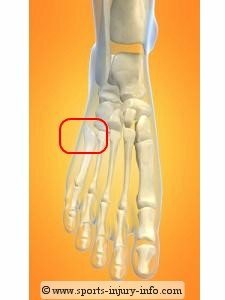 The base of the 5th metatarsal happens to be one of these areas. The body needs blood supply in order to heal. Blood carries all of the needed materials to repair the injured area. And so, when there isn't much supply, the healing tends to take longer, or not occur at all. This specific place on the 5th metatarsal may not have good blood supply, and so the two bone ends may not heal correctly. The bad part is that you may not know if it is going to heal right for several weeks. And that slows down the recovery time. So what happens if it doesn't heal? Again, most fractures of the 5th metatarsal base will heal correctly with just a cast and crutches. You won't be able to put weight on the leg, and will not be able to move the foot for several weeks, usually 6-8. Your doctor will take X-rays periodically to monitor the fractures healing. And as long as it is healing, all is well. When the bone fails to heal, it may require surgery to put the ends back together. This usually involves placing a small screw into the bone, pulling the ends back together. After surgery, you will have to go through the cast and crutches routine for 6-8 weeks, and then gradually return to activities. You may also need rehabilitation after your cast is removed. Sometimes, if the bone ends are not aligned, surgery may be done immediately. This is especially true if the fracture is severly displaced, or if it is angled along the bone. Everyone wants to know when they can get back into the game and off the sidelines. For most fractures, it takes 6 weeks to completely heal, and then another 2-3 weeks to get muscle strength and range of motion back. After a Jones fracture, this timeline may be a little longer, because of the watershed area and the slower healing rate due to low blood supply. Age can also play a role in healing times, as younger bones tend to heal a little faster. Jones fractures can be overlooked if you don't know the symptoms. If you have pain, swelling, or difficulty walking, see your physician for an evaluation. It is imperitive that this type of fracture be cared for well because of the possible complications. If in doubt, get it looked at.